At this point I shouldn't have to extol the virtues of NBC's Parks and Recreation. Sure it had a rocky first season, but once Paul Schneider exited to make room for Adam Scott and Rob Lowe, it was pretty much comic gold from that point on. But the most miraculous recovery comes in the form of Chris Pratt. 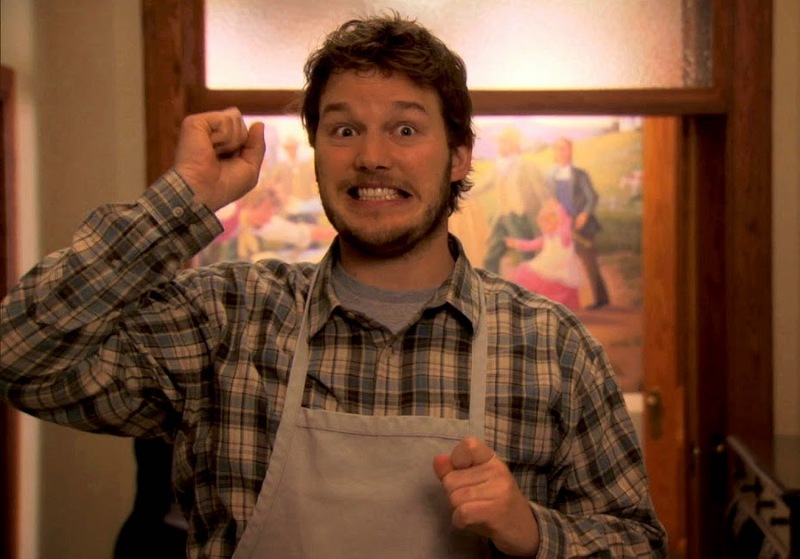 When I watched the pilot I thought that Andy Dwyer was perhaps the most irritating and unfunny character imaginable. Now he is quite simply THE BEST. The show is about to kick off it's final season and I'm both happy and depressed that NBC is airing the last run of episodes two and a time (Hurrah!) in order to burn off the show as quickly as possible. (Boo!) But when it's all said and done, at least I can live secure in the knowledge that Chris Pratt has a very healthy movie career ahead of him. Next up on the docket is Jurrasic World, the fourth sequel to Jurassic Park, and hey, "park" is also in the title of his TV show, so of course an intrepid YouTube user has utilized this clever bit of wordplay to generate an alternate trailer in which Pratt's dino-wrangler is actually Andy Dwyer the whole time! I'm sorry, but that last bit with the Parks and Rec theme song playing over the raptors just downright tickles me. Also, Pratt's actual Jurassic World dialogue, which feels so stiff and awkward in the real trailer, works like gangbusters when intercut with the Burt Macklin shtick. I will now choose to believe that Pratt actually shot this whole movie in character as Andy Dwyer playing Burt Macklin. This can only enhance my enjoyment of the final film.